I finished eBusiness today. For more information check out the Live Demo and Features page. You can also check out a live demo of the alternate skins Radiate and Smooth. I know that this theme took a bit longer than usual to finish – sometimes it’s hard to finalize something when everyone keeps commenting on the sneak peak post giving me new ideas! As I stated in my preview post, I titled this theme “eBusiness” due to its emphasis on utilizing a “page-based layout.” This means that, in its essence, it was created to perform more as a CMS than a blog, however, you will see that you are also free to abandon the page-based structure and run a more traditional blog. You can also implement a blog section into your page-based website. 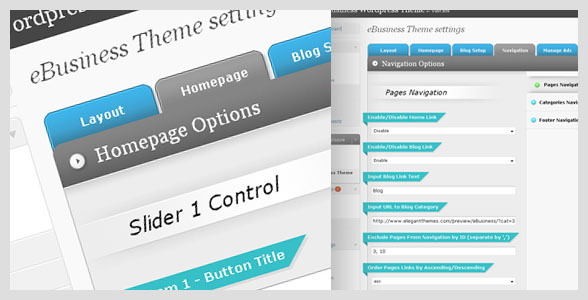 I have added several new options to the Theme Options page of eBusiness. Because of this it was getting rather annoying to navigate the page, having to scroll down an endless single column to edit and save your changes. For this reason I have completely revamped the options page, organizing its content into an easy-to-use two-tier tabbed menu. I get a lot of questions about how my themes work, and what exactly is offered in these “options pages.” To help better illustrate exactly how this theme works I will try and give a written overview now. There are 5 main sections in the options page: Layout, Homepage, Blog Setup, Navigation, and Manage Ads. Each of these sections is divided into several sub tabs for your convenience. I will give you a brief overview about what each of these sections has to offer. 1. LAYOUT – The layout tab houses some of the major overlying options that effect the structure and appearance of your website. 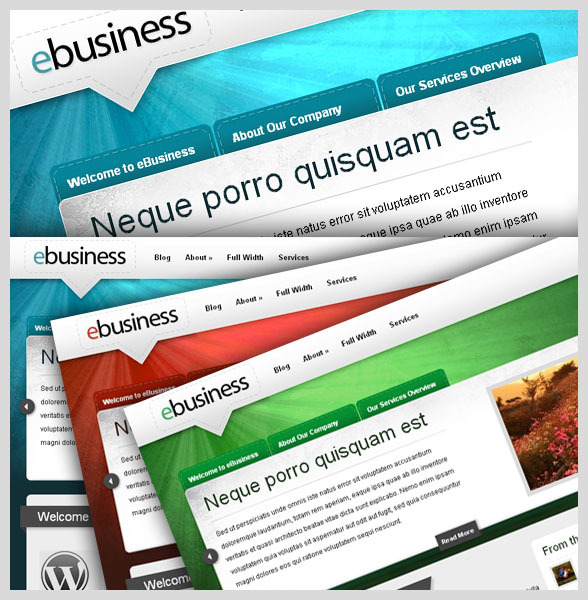 Color Schemes – eBusiness comes with three skins, and each skin comes in three colors. You can switch between these 9 different variations at any time from the dropdown menu. Website Structure – The essence of eBusiness is to act as a CMS, creating a page-based layout. I have, however, included the option to bypass the page-based homepage in favor of a normal blog layout. You can switch between Page Structure and Blog Structure at any time. Footer Options – You will notice that each page has a widgetized footer on the bottom. I realize that if you are using eBusiness as CMS you may not have the need for standard widget items, which are usually blog related. This option allows you to turn off the footer completely if you don’t intend to use it, or if you find yourself filling it with unnecessary text widgets and what-not to fill out the design. About Me Section – As with my other themes I have included an “About Me” widget that can be added to the sidebar. You can customize that here. 2. HOMEPAGE – The homepage tab allows you to manage your homepage. If you are using blog style then most of these options do not apply, but if you are using the Page-based system then you will have to use this area to set up your homepage. Slider Control – You will notice that the demo features 3 sliding elements on the top of the homepage. These are managed via the Homepage tab. Here you can customize the content text, the title of the tab, the text used in the button, the thumbnail image (which is automatically re-sized) and an optional read more link, which can be pointed anywhere. You can also choose how many sliding elements to display, between 1 and 3. Pages Control – The content on the homepage is made up of WordPress pages. You will create a page in wp-admin and then define the page to be used in the Homepage options tab. Simply input the page id of the pages you want to use and they will appear. You can also choose how many pages you want to use, anywhere from 1-4. Blog Scroller – Even if you are using the page-based system you can still have a blog area on your site. For this reason I have included a blogroll on the homepage with a link to your most recent posts. This can be turned off if you don’t plan to have a blog section. You can choose how many recent posts to display. You can also customize the RSS link if you want to point it towards your feedburner account. 3. BLOG SETUP – If you are using the Blog Structure, or if you plan to include a blog within your Page-based website, you can customize your blog here. I tried to give a bit more control over various elements of the blog, inspired by the most common requests on the forum. Post Format – You can choose between “Blog Style” mode or “Default” mode. The Blog Style mode displays your posts in full on index pages, while Default mode automatically truncates the post to create a short preview with a “read more” link. Unlike my other themes you can now customize how long your post preview is when using Default mode. Simply input the number of characters you would like to display. Another thing I added is the ability to use your post excerpt as the preview, instead of the automated truncation. Categories Bar – The categories bar, with links to your various blog categories, only appears on blog pages. However, if you are using the blog as simply a recent news section, and don’t plan to have several categories, you can turn off this categories bar. I realize that having a large red bar that spans the width of the page with a single link pointing to the page you are already on would have been pointless! Further Post Preview Control – In addition to editing the length of the post previews you can also adjust the size of the thumbnail, as well as enable/disable the “read more” link and post info bar. Thanks to timthumb all thumbnails are automatically re-sized, cropped, and cached, which means you can change the size of your thumbnails instantly at the click of a button. You can also hide the thumbnails altogether if you don’t want any. You can also adjust the quality of the thumbnails, raising/reducing it depending on how fast you want your load time to be. 4. NAVIGATION OPTIONS – The navigation options allow you to customize the navigation bar. You can use this to exclude pages from the navigation, adjust the order of the links, add a link to your Blog section (if you are using one) and so on. Both the categories and pages navigation bars can be edited here. 5. ADVERTISEMENT MANAGEMENT – As with the rest of my themes I have included a banner management system. You can add 125×125 and 468×60 banners here. Within the page I have added a banner preview for each field so that you can see what banner you want to edit more easily. I have also added the option to choose how many 125×125 banners you want to display. This was a very common request on the forums. You can now choose between 2-8 banners, all of which are editable in the theme options page. You can also choose where you want banners to be displayed. You can add them to your pages sidebar, blog sidebar or both. You also have the option to disable them completely. 1. EARTHEN – I realize that the default layout is very “niche” in its grungy appearances, and I wanted to be sure to include other options as well. eBusiness comes with three different skins, and each skin comes in three different color schemes for a total of nine choices. The first, which I like to call “Earthen,” features a grungy naturalistic design. Earthen comes in three colors, including Red, Blue and Purple. You take a look at the live demo here. 2. RADIATE – The second skin is called “Radiate,” and features a more high-tech style with a professional twist. I wanted to create something flashy and exciting that wasn’t necessarily tied to any specific type of website. This skin comes in three colors, including Blue, Green and Red. You can check out the live demo here. 3. SMOOTH – After posting these two previews on twitter I received some concern that both layouts were too busy for some people’s tastes. For this reason I created a third skin, titled “Smooth,” that is a bit more modest in its approach. I hope that people who are looking for a more traditional business layout will find this skin usefull. Like the rest it comes in three colors, including Blue, Green and Pink. You can view the live demo here. As always, stay tuned for more themes! Don’t forget to follow me on twitter for the most recent updates on upcomming themes. nice work… and keep making good themes for all!!! OMG, this theme is just mind blowing… one of the best in Elegant Themes. Thanks for your continued surprises all through the year. Glad to be a member of Elegant Themes! this is the best theme ever, and if next-next theme will be better i couldn’t think how it is possible.. from now on the price getting cheaper for sure. 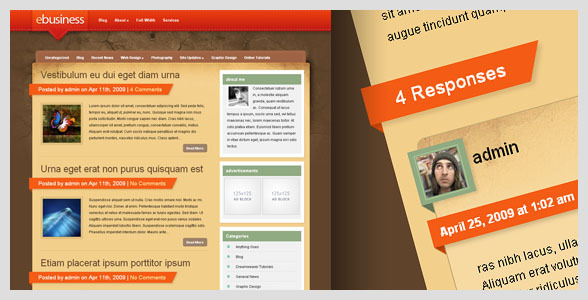 you should check the css for blog style post format, because the post info not using image like others. The best theme on the site. Tons of choices (skin + color) and I like how you can customize all the content with all the theme options. Great job Nick! I don`t have a reply button… Is the problem only with my site ?? Do you have threaded comments enabled? You really improve with each new theme, great looking theme! All the buttons are existing, but in the content below there is nothing, i have tried Chrome and IE. This could also occur if you have failed to upload the eBusiness/js folder, if you have uploaded the incorrect theme folder, or if you have changed the name of the theme folder. Anything that obstructs the relative path to the eBusiness theme directory can result in problems. In any event, please move your support inquiry to the forums and post the URL to your blog. Dude you are just awesome!!! I’m having the same problem with the control panel. This is also a brand new install for WP. 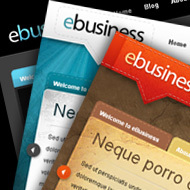 Drag the eBusiness theme into wp theme folder without making any changes. Checked the “js folder” and it is there. Please use the support forum, I need more information. Thanks. Found the problem, check your forum post for the fix. Hey, you stated your problem exactly in your question. You have to upload the folder “ebusiness” and not the folder “theme” and you should be fine…. Real great one, and SO many different styles and colors – awesome! Nick, you’re one of the most tallented and innovative designers out there. Beautiful work, well done! I must say that this is one incredible theme. The colors you picked are perfect. i do indeed love it! I will be sure to list this as this coming weeks “featured theme” on my site. thanks a lot! we all love it! Is there something in particular this module requires to run from the server? I’m so mad! I just completed my web site using a premium theme I purchased else where and then I found this new theme on Elegant Themes. It is sooo much more “elegant” than my other one, I must start over! I love the default grunge look and the attention you spend on every detail of your themes. All I have to say is: Worth. The. Wait. I sure hope you are getting a lot of new customers with this theme. I’d hate to see you not become prosperous, because you are absolutely gifted. IMO, your membership price is too low. You need to double it up or something. The value here for your customers is a steal. This theme is amazing. Thank you, I am finally going to put one of your great themes to use! The requested URL /members/download/eBusinessTheme.zip was not found on this server. Disregard my previous comment. I guess that was a temporary glitch. The second try worked. WordPress is free, as in free beer. WordPress.com is free too, they do charge a nominal amount for a handful of premium services. The major downside is you can’t install your own themes, like the ones you find here. Both versions are free. The only difference is one is hosted by WordPress and one is hosted by your own server. I know that this is probably NOT what you were hoping for as far as kudos for the new design but IT’S COMPLETELY ADORABLE!!!!! I already am a member but I was shopping around at all the other sites tonight, looking for some new ideas and wow am I glad I stopped by at home!!! All’s I gotta say —- SUPER CUTE! Wonderful theme! Worth the waiting! I want to have the categories like here: http://www.elegantthemes.com/preview/eBusiness/?p=25 but I see no difference when I switch from blog style to page based navigation. I have all the categories, but they just won’t show up with this theme. It’s possible that you have the categories navigation bar disabled. 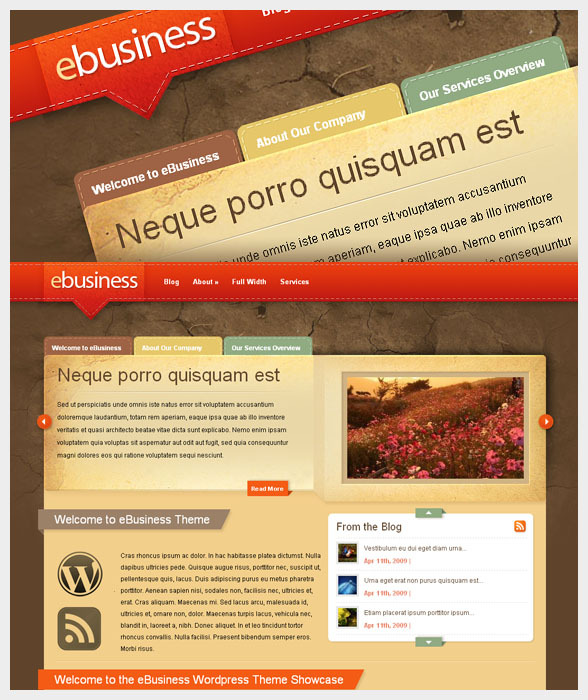 Check the “Blog” tab in the eBusiness Theme Options page. To use the forum you first need to register, just click the register link on the top of the page. Really wonderful, the Full Width option helps a lot, easier life. Congratulations on another fine job. Awesome theme. Love all the options and the new user panel. Have already implemented the Blog style on my site. Thanks! Wonder if any problem with WP e-Commerce plug in ? I’ve spent a lot of time working with wordpress and themes and I can honestly say this is one of the nicest I’ve seen. Great attention to detail and respect for postponing launch until you were completely happy with it. To any one reading this who hasn’t joined elegant themes, I can’t recommend joining enough. All the themes available are excellent and with membership being so cheap, it really is a bargain! Nick 🙂 Kudos to you. This is the best yet. What a stunning theme! And as amazing as it looks on the frontend, the admin functions you’ve created on the backend are as impressive, if not more so. Easily one of the best page-based themes I’ve seen. I can’t get it to work, of course, but I’ll keep trying. It seems that if I use one of your themes I can’t use any others without completely reinstalling WordPress, which I can only do so many times. Please use the support forum to detail any issues you have, I need more information before I can diagnose the problem. 3 words: worth the wait! Nice! I think this is the first business theme from Elegant Theme! Another incredible theme. Keep up the good work! can we place Ads in the homepage instead of “from the blog” box?? Amazing theme, and I love your taste in colour and design. Proud to be a member. Dude your themes are amazing. I would pay like $300 a year for my membership to elegant themes. Your a legend! GREAT!!! The best theme I ever saw!!! Wonderful. Best One Yet. I cannot even imagine the time you put into this one. 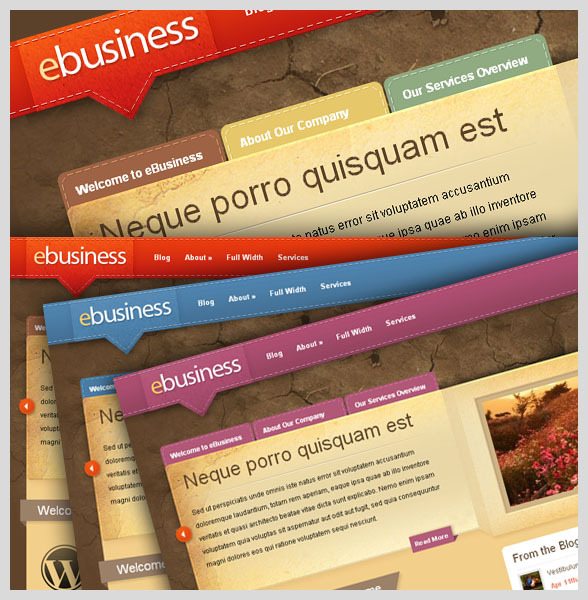 eBusiness is truly an impressive small business-oriented theme. Bookmarking to refer to fellow WordPress enthusiasts and clients looking for a referral. Haven’t tested it yet, but it looks amazing! i could tell that this is really amazing wptheme that I’ve ever seen… i haven’t tried it yet but i know it is because of the features that provided in the demo. i have something to ask if the user could able to change the mouseover “bounce” effect of the 3 tab menus in the home page into permanent or not movable. i salute you did the good job.. congrats! I am so happy to be a part of Elegant themes members! This is not related to the theme. Awesome theme… i came to know about this from a blog and I subscribed to your service. Awesome and i can see each theme is getting advanced and have lot of good features. I was looking for a corporate theme. I understand that being this theme have two outlook as CMS and Blog, I believe that i can make the best out of it. The other question I had is what is the purpose of the photoshop files? If you have Adobe Photoshop you can open the .psd files, which are the original source files for the design, to manipulate the theme more easily. This usually only applies if you have graphic design experience and wish to make big changes to the design. I am thinking of editing the theme to a “fluid width” one, quite a number of things to change at first look. Do you have any advice if there’s a quick fix to it? Unfortunately there is no quick fix for making this theme fluid. Almost every major element of the design would need to be changed, even a lot of the images will need to be edited. I wish I could give better advice, but it’s one of those things that simply takes time and experience to accomplish. If you have a more specific question let me know. how about a “fixed” one? would it be difficult too? So… do you working now with new theme? (blog/magazine)? :)) I can not wait for this. it’s really beautiful, I love it !! You know i love the Studio Blue theme and i have been using it on all my better blogs that i own. Because of the love, thus came in my contribution to the theme in the support forum. However eBusiness simply blew my mind. It’s one power packed theme and i really love it. Although it’s of much practical use to business blogs only but still all the features, specially “Front page” “blog” and “full width page” are worth the time you took on this theme. Bravo! Gracias! Your themes are awesome. 🙂 How often do you post new designs? Thanks for offering them to us folks out here! I try to make 1-2 per month, but it really depends on the theme and how busy I am. I don’t guarantee any specific theme release frequency. Best Theme in collection! I will soon redesign my blog. The themes are elegant and classy. I love it. Seriously, this theme is RIDICULOUSLY AWESOME !! Thanks for such a good work!! Absolutely fantastic … love this theme … thank you guys …. Now … how about an eCommerce/eTrade theme? i liked the control panel, the admin area. its with so much ease. This by far one of the most brilliant web templates I have seen on the net and I really cannot thank you enough for providing such remarkable skills at such a remarkably generous membership fee. It’s coming along – should be out in less than a week. I have most of it coded, just adding features and debugging IE at this point. Would be nice if you released another theme… it’s been awhile. ePhoto should be out in less than a week. The E-photo is awesome when you release it :???????????? Just joined and these are all great themes and the price is unbelievable. IN Business theme, you have that scrolling factor on Home page – Carosual. It goes from right to left. What you can do is – Move the text part from right to left and the image part can go from bottom to top. Oh dear… this one is fantastic, I must have it. I prefer the original colour tothe two options. I want to use a WordPress site as a traditional website but incorporate a blog and allow a client to use it as a CMS in order to add news / dates etc. I’m not bad with XHTML and CSS and I understand the idea of php includes but I am new to WordPress… as a member, do I get support? This is a beautiful theme! Definitely the best WordPress theme I’ve seen so far. Awesome work! Quick question: I want to use it for a hardwood floor blog. How easy would it be to change the background to a wood floor image? Would this be possible in Photoshop with the PSD files you provide? Thanks again for designing such a great template. this is the best i have seen anywhere … would love to see a full screen shot of radiate red, earthen blue, and smooth green before i buy … would it be possible to get jpegs of these? home page only? question … is your template setup to use an image instead of text for the logo in the header? can i use a gif there?? The logo is an image and the image is a PNG. I notice that you say that generally images are supplied in PSD format but if you don’t use Photoshop, are the images editable in Fireworks? Is the PNG image complete with layers or has it been flattened? Hi, what’s the plugin I should install to add threaded comments like you have? No plugins are use/required for the threaded comments display. Be sure to enabled threaded comments in wp-admin. Just spotted something… on the preview of eBusiness, blog page, the bullets for “recent comments” overlap the text. I`m curios of something. I found this website http://www.ridemomentum.com/ and the theme is almost the same with yours but in the footer says: Designed by Steeze Lab. If you have no relations with them one question arises 🙂 : Did you inspired (copied) from their design or they copied you ? That’s just someone using my theme, no one copied anyone. I don’t have any rules about how you edit the theme. If you want to remove my link and put your own that’s fine with me. You paid for the themes, I don’t have any restrictions on how you use them as long as you don’t redistribute them. I see, but do you allow them to claim that they made the design ? Yup, he did. Read the terms and services. It’s one of the most important parts of any digital product. Basically his TOS says no resale but anything else is fair game. We do pay for the things after all, and they are well worth the money for anyone reading this. Highly recommended. How to make the blog section? where’s to make the link? Don’t forget to read the readme file for installation instructions. You can also refer to the video tutorial in the members area that addresses this issue. If you require further assistance please open a thread in the support forum. I’ve just become a member and downloaded eBusiness and am now getting to know the theme via a local setup using XAMPP. I can’t believe the power of this theme!! It’s obvious that the theme looks a million dollars but what stands out for me is the documentation and videos in the members area… saved me hours. I know nothing, or even less than nothing, about WordPress and my local installation is up and running. Once the ePanel is released I’ll go live. i have used this in my site..
hi admin ! i’m using ur ebusiness theme but how to show home page contents and how to manage? where i should create a page and give its id in control panel? i’m sorry i’m unable to figure it out…. u r great at design ! hi admin ! I wana tell u one tiny bug in ur featured slider animation , just add stop() before animation starts… otherwise it will animate if someone hover over for many times.. I just customize it a little with easing ! Hey, this the theme that i need but before I purchase it I would like to know if there are social buttons, share things we can add easily…? 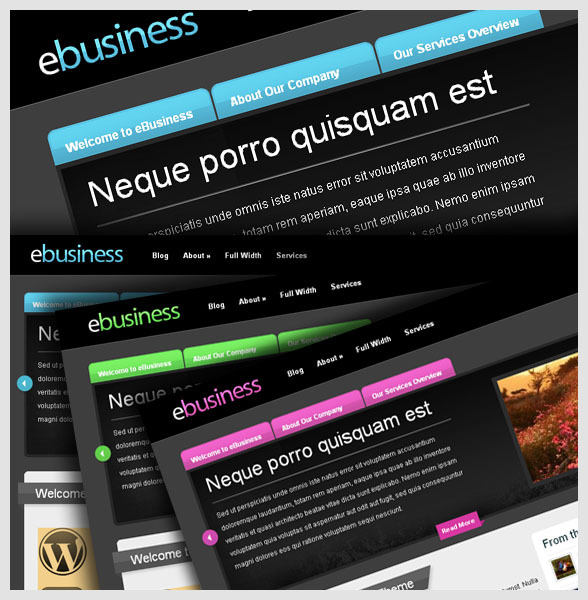 Just uploaded my ebusiness theme and configured it via the ePanel… fantastic. Watched the tutorial videos and read the theme documentation and all went well. Worth every penny.. sorry, cent. Now have a WordPress site that I feel proud of… thanks Nick. i have installed this theme, but why i cannot see image at slider 1 to 3 meanwhile i have uploaded the files and put the url at homepage settings. If you need help, please open a thread on the support forum and we will assist you. I must admit you’re one of the best WordPress theme developers I’ve seen. I think the work you produce is so outstanding and professional. Not to mention the number of templates you get as a paid member. I have actually recommended your site and gotten few people to become paid members. Keep up the good work, Nick! My Clients are gonna love this theme.. That means more money for me from affiliate sales! Very nice information on these great themes. Thank you for sharing! The slider doesn’t work for me in Internet Explorer, neither do sub-menus 🙁 In Mozilla evrything works fine. If you need help, please open a thread in the support forum. There’s any chance that do I find this theme for Blogger ? hi my friend have the theme, and the reply comment to her subscriber is not function. Can u help? I would like to know if the background can be modified from the rock or stone looking default that the theme has. As with the rest of my themes I have included a banner management system. You can add 125×125 and 468×60 banners here. Within the page I have added a banner preview for each field so that you can see what banner you want to edit more easily. I have also added the option to choose how many 125×125 banners you want to display. This was a very common request on the forums. You can now choose between 2-8 banners, all of which are editable in the theme options page. You can also choose where you want banners to be displayed. You can add them to your pages sidebar, blog sidebar or both. You also have the option to disable them completely. Hi there. This is one of the best themes i’ve seem! Ok a quick question here…please guide me how I can use the drop-down menus in the header section. For example a header menu is created as ‘Our Product’ and when we Mouseover it, the child menus (sub menus) to display as Product1 Product2 etc. Please advice on the Menu Mouseover. this is nice but i am not able to add images on slider please give me the solution as soon as possible. I have used the e-business for several years and I can’t figure out how to enable the sidebars on the home page middle section. The page it is drawing to that area has sidebars that I need but they do not show on the home page.